Valuable information about the local environment of the aluminum nucleus can be obtained through 27Al Nuclear Magnetic Resonance (NMR) parameters like the isotropic chemical shift, scalar and quadrupolar coupling constants, and relaxation rate. With nearly 250 scientific articles per year dealing with 27Al NMR spectroscopy, this analytical tool has become popular because of the recent progress that has made the acquisition and interpretation of the NMR data much easier. The application of 27Al NMR techniques to various classes of compounds, either in solution or solid-state, has been shown to be extremely informative concerning local structure and chemistry of aluminum in its various environments. The development of experimental methodologies combined with theoretical approaches and modeling has contributed to major advances in spectroscopic characterization especially in materials sciences where long-range periodicity and classical local NMR probes are lacking. 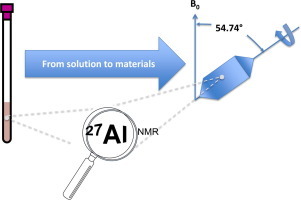 In this review we will present an overview of results obtained by 27Al NMR as well as the most relevant methodological developments over the last 25years, concerning particularly on progress in the application of liquid- and solid-state 27Al NMR to the study of aluminum-based materials such as aluminum polyoxoanions, zeolites, aluminophosphates, and metal-organic-frameworks. [NMR paper] Recent advances in magic angle spinning solid state NMR of membrane proteins. [NMR paper] Recent advances in protein NMR spectroscopy and their implications in protein therapeutics research. [NMR tweet] ??? ????? ??? ???????(aluminosilicate)? ??? ????? ?? ??? 27Al ? ?? ?? ??? (solid-state 27Al nuclear magnetic resonance)? ?? ???? ?.